Pop Slice Making Machine It is suitable to packing liquid materials in the pharmacy, food, daily, and other industries. Juice, wine, jell and many more can be filled using this model. Results are great. Three-step sealing roller, four side sealing. Machine runs continuously, fast and efficient as well as stable in function, low noise, tight sealing, smooth and delicacy in bag outlook, and extraordinary in packing efficiency. Famed PLC and touch screen are adopted to make adjusting easy. Photoelectric tracking system is adopted to ensure correct printing and accurate counting. Famed transducer is adopted for step less adjust running speed, intelligent temperature controller is used to adjust sealing temperature, with reliable performance and convenient to adjust. 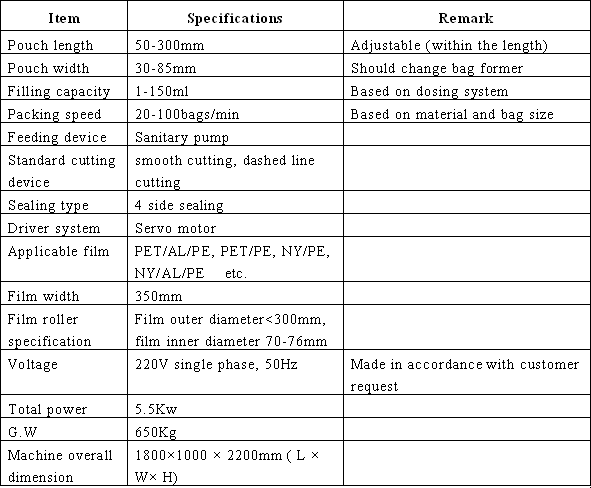 Servo motor driver is adopted, pouch length can be setup directly at the touch screen, at the same time longitudinal sealing and transverse sealing are auto in-phase tracking, it saves more time and material compare with mechanical driver, and bag pulling more smooth and much easier to adjust. Sanitary pump is adopted for automatic feeding and precise in dosing, it can fill material with high temperature, more suitable to high speed bag packing machine's using. Looking for ideal Ice Lolly Packing Machine Manufacturer & supplier ? We have a wide selection at great prices to help you get creative. All the Pop Slice Making Machine are quality guaranteed. We are China Origin Factory of Double Line Liquid Filling and Packing Machine. If you have any question, please feel free to contact us.